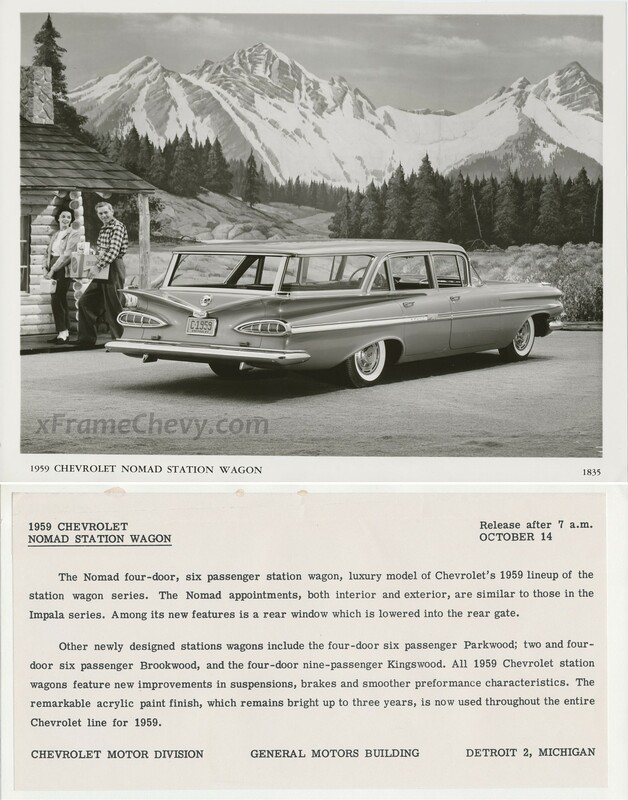 This press release photo from GM Photographic shows the 1959 Nomad Wagon. The Nomad was no longer a 2-door car starting in ’58. It was a 4-door with the Impala trim line.From 1955 to 1958, Nomad wagons had vertical chrome strips on the tailgate, but in ’59 the tailgate design did not allow for such a feature, so those vertical strips were put on the tail light lenses. This treatment was also applied to the Impala Sport Coupe, Sport Sedan, and Convertible. The Nomad four-door, six passenger station wagon, luxury model of Chevrolet’s 1959 lineup of the station wagon series. The Nomad appointments, both interior and exterior, are similar to those in the Impala series. Among its new features is a rear window which is lowered into the rear gate. Other newly designed station wagons include the four-door six passenger Parkwood; two and four-door six passenger Brookwood, and the four-door nine-passenger Kingswood. All 1959 Chevrolet station wagons feature new improvements in suspensions, brakes and smoother performance charactaristics. The remarkable acrylic paint finish, which remains bright up to three years, is now used throughout the entire Chevrolet line for 1959.